Does the idea of an easy, safe and trouble free pet sound too good to be true? 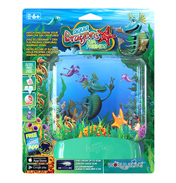 The eggs of Brine Shrimp, or Sea Monkeys as they are commonly known, are inactive. To all intents and purposes they are non-living and can remain so for two years if they are kept in a dry place that is free of oxygen. Once they have been placed in salt water these eggs will hatch within a few hours. 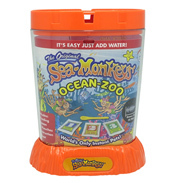 Your Sea Monkey tank is expected to last for about two years. 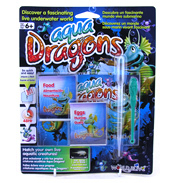 The packets contained in your kit will be labelled Water Purifier, Instant Life Eggs and Growth food. The Water Purifier packet will contain salt and some eggs. 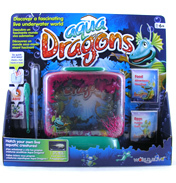 This is added to the water and then 24 hours later you will be instructed to add the Instant Life Eggs. 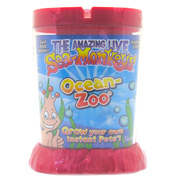 This packet contains more eggs and salt as well as yeast and sometimes a dye, which makes the Sea Monkeys that have been hatched from the eggs added the previous day seemingly appear instantly! Growth food containing more yeast and an animal food called Spirulina is then added every few days. The idea of selling these eggs in hatching kits as a novelty pet was invented in 1962 by Harold Von Braunhut, an American inventor who was also the creator of X-Ray Specs. 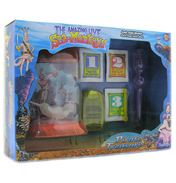 Ant farms had been made popular the year before and the sales of Sea Monkeys soared when comic book style ads appeared showing animated Sea Monkeys living in a fantasy underwater world.